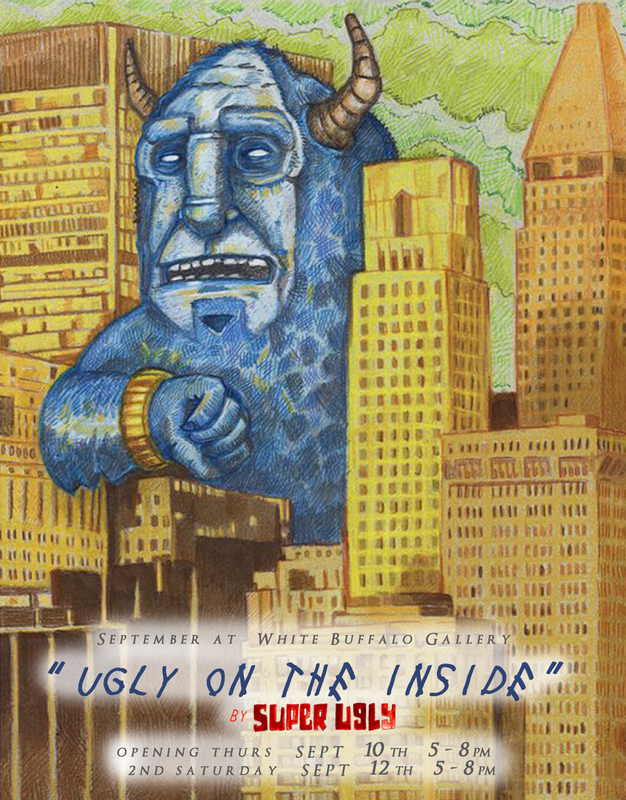 White Buffalo Gallery is excited to present “Ugly on the Inside” art of Super Ugly for September running until October 3rd. Super Ugly is a monstrous creature, stuffed to the rafters with cartoon escapades and sci-fi adventures. Never filling a blank space without a purpose, each story is told with a collection of odd shaped creatures and spacemen who make bad life choices. Life is not pretty, art should reflect the ugly inside all of us, which makes us the unique characters in our own movie… Super Ugly does that by painting his way through the mundane lives of those who exist right on the fringe of “normal”, letting the strange speak through his work. Super Ugly is an artist who has been creating for over 25 years, from music to art, forcing his thoughts upon the masses whether they wanted it or not. His inspiration comes from his obsessions with comic books, action figures and cartoons, a sponge of useless information which is reflected in his work. All the voices in his head mashing together, pushing him to tell their stories at the same time.